Hey Y'all. Excuse my southern drawl, I just watched Paula Deen on Rachel Ray and sometimes she brings out the y'all in me. Sad news. Tonight is my last night of being FHE mother. The semester doesn't end for a couple weeks but this will be our last FHE with our small little group. This group has been great, we legitimately feel like a family. We have real lessons where we really discuss the gospel instead of just trudging through it. We talk with each other and check in during the week and we can always count on a friend at church. One time we even postponed/replaced the lesson with discussing one of our "brother's" relationship and how he could get a girl to commit. When someone is sick in our family, we know about it. It's darling. Most definitely the best FHE family I have had in my singles ward experience. Anyway, one of my "sons" has asked me to a little mending for him. I sewed up a hole in his shorts a few weeks ago and last week he came with another pair. I feel so environmentally friendly when I repair clothing: like reduce, REUSE, recycle... ya know? And it is reminding me how much I love to sew or be the sewer girl. 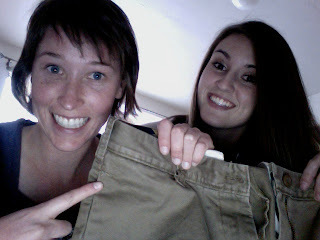 Shayna and I took some photos to document the special repairing of the pants. lame, you can't even tell that I did anything- but maybe that is a good thing? 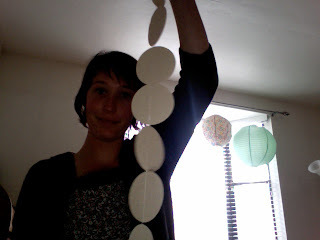 On another craft note: It is Sarah Jane's Bridal shower this week! I am so excited. It will be so fun, you should come. 7-9 Thursday at my apartment. I have been a busy beaver making some fun crafts for this joyous event- but I will post pictures with the full documentation a wee bit later. LOVE the picture of you and Danny--you look so pretty. And I love you as the sewer as well. I just finished a cute quilt where I hand sewed the border for my first time. (my mom usually does that part). You would be so proud. can i be you when i grow up?? just seeing this post now. love that you had a great FHE group. and i can't believe you did the making and mending. nice work. one day, I'll hop back on the blogging train. Until then, you are doing great at it.